Two Hollywood Stars, Leonardo DiCaprio and Liam Neeson were awarded with Special Humanitarian awards at International Movie Awards in Jakarta. 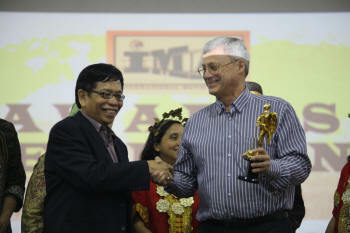 The award was presented by Dr. Jallaludin Rahmat, a parliement member and a moviemaker himself. According to him the International Movie Awards was established to support independent filmmakers, movie stars, and talents to get international recognitions, exposure, and opportunity for their careers. International Movie Awards 2015 was conducted by The Indonesian Council of Creative People (Dewan Kreatif Rakyat). I love you so much directed by Orhan Tekeoglu From Turkey was chosen as the overall winner. Overall winner of the International Movie Awards 2015: I Loved You So Much (Turkey), directed by Orhan Tekeoglu.